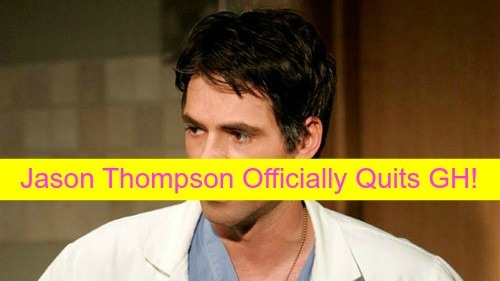 General Hospital Spoilers: Jason Thompson Officially Quits GH – Replacing Burgess Jenkins on The Young and the Restless? The Young and the Restless (Y&R) spoilers ask if Y&R has hired Jason Thompson to replace Burgess Jenkins as Billy Abbott? General Hospital (GH) mega star, Jason Thompson is officially exiting from the soap after portraying Dr. Patrick Drake for over a decade. The report came from an inside source that told CBS Soaps in Depth exclusively that it was Thompson’s choice NOT to renew his contract with “GH.” Jason Thompson has also confirmed his departure on Instagram. Ever since, the information leaked that Thompson was leaving the ABC daytime drama, “The Young and the Restless” and “Days of Our Lives” are reportedly trying to lure Thompson to portray iconic roles on those soaps. Do you think Jason Thompson would make a better Billy Abbott or EJ DiMera? Jason Thompson has not been happy with “General Hospital” for quite some time. He had said a few months ago that he wasn’t sure what Dr. Patrick’s future will be after Sam Morgan [Kelly Monaco] learns that her husband Jason [Billy Miller] is alive. Many fans felt that without Sam, his storylines won’t be as strong. Even so, fan assumed he’d renew his contract – at least for another year – but no such luck. Adding momentum to the departure rumors, “General Hospital” released a casting call that could easily be a recast for Dr. Patrick Drake. In the casting call, it stated they were looking for a ‘bonefide ladies’ man’ in the same age range as Thompson. Could the casting call actually be a recast? Imagine the “General Hospital” fans surprise when they learned that Thompson was planning on NOT signing a new contract and would exit the soap after November sweeps. He has spent ten years as a main fiber of the show; it was shocking for long-time fans to come to terms with his decision to leave. CBS Soaps in Depth reported that multiple sources stated, “The Young and the Restless” wants to recruit Jason to play an iconic role, teasing that Jason may replace Burgess Jenkins as Billy Abbott after November sweeps. And in the small chance “Y&R” doesn’t work out, there is talk that another soap may be interested in bringing him on too. It is looking like the other soap is “Days of Our Lives.” They have been looking for a recast for the iconic character of EJ DiMera, stating a character as important as him, they cannot afford to make a casting mistake. The official announcement that Jason Thompson is exiting “General Hospital” after November sweeps is on CDL and we predicted his departure 10 days ago. Can you see Jason Thompson portraying Billy Abbott or EJ DiMera? Don’t forget to come back later for CDL juicy soap opera spoilers, rumors, and updates! General Hospital Spoilers: Michelle Stafford, Former The Young and the Restless Star, Announces New Baby Boy Birth!